Printing News & Reviews Magazine for Inkjet, Laserjet Printers, Ink, Toner, Paper. Another fine looking printer from Epson with a small desk footprint arrives in our stores. The new Epson Stylus SX435W from their small-in-one range of printers offers standalone and WiFi printing. No USB cable is required to set-up a wireless connection with automatic set-up. 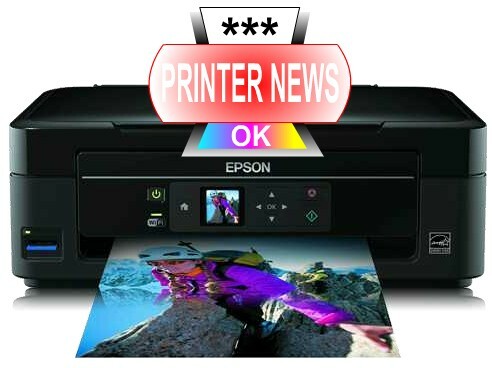 Epson have added a mobile printing option to the arsenal of the SX435W via the Epson printing app. There are also memory card slots that allow users to directly view images via the 3.6cm LCD colour screen and then print them without the need of a PC or Mac. The rear paper tray holds between 80 and 100 sheets of A4 paper. Sliders can be adjusted to allow the use of various paper sizes and envelopes down to 9x13cm. The CIS flat bed colour scanner has a resolution of 1200x2400dpi and produces acceptable results for everyday use. We recently reviewed the Canon Pixma Pro 1 printer that has 12,288 print head nozzles. In comparison the Epson Stylus SX435W four colour micro piezo print head uses only 128 black nozzles and a total of 126 colour nozzles. This adds up to a considerably smaller print resolution than the expensive Canon printer, however it still manages to produce half decent pictures for the untrained eye. The SX435W uses either Fox or Apple inks (T1281-T1284 or T1291-1294) which multi-packs retail for approximately £30 and £45 respectively. The Fox inks in particular do not contain very much Ink, so printing costs can be high if using genuine cartridges. The temptation will be to use compatible or refillable cartridges with this machine. If doing so it is important to buy premium quality versions that contain suitable Inks. Otherwise you could suffer from blocked nozzles and heads. The Epson Stylus SX435W is recommended by the Energy Saving Trust because it only uses 15W of power when performing standalone copying and 3W in sleep mode. In summary the Epson Stylus SX435W offers a cheap home printing solution with attractive styling. We feel that this machine is designed for lower frequency printer users who need to print documents and snap shots. The mobile printing function could be useful to mobile phone and tablet users alike. The opinions expressed in Printer News Website do not necessarily reflect those of the editor. Reviews are based on opinions and readers should gather information about products from a wide range of media in order to get a balanced view. Don't take one persons word for it!